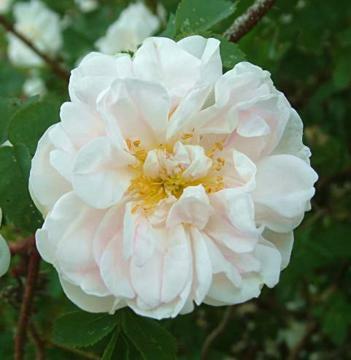 Scots rose with a spreading, twiggy habit, prickly stems and ferny, dark greyish green leaves. Fully double, loosely cupped, scented, pale blush pink flowers up to 7cm across, held singly on slender stems and unusually for a Scotch rose, repeat flowers from summer to autumn. Prefers well-drained light sandy soils. Disease resistant and very hardy, but may be prone to aphid attack.